She needed a place to stay. He needed to save his ranch. Together they just might make a home.Sgt. Dylan Banks lost more than just his leg in the war. His fiancée and family turned their backs on him as well. Now, he’s determined to create a safe place where wounded warriors like himself can heal. But a hidden zoning law requires all residents of the Purple Heart Ranch to be married. To save his dream, Dylan and his men will have to tie the knot—but can a man with such deep scars inside and out believe in love again? Maggie Shaw lost both her job as a veterinary technician and her apartment on the same day. Who knew her unreasonable landlord would kick her out for being four dogs over the one pet limit? Now, she and her gang of special-needs dogs are in trouble. Fate puts her in Dylan’s path with a proposal that seems too good to be true—but can her heart bear a loveless marriage of convenience? Dylan yearns to reach out for Maggie’s healing touch, but he keeps his distance, convinced his wounds are too deep for her embrace. 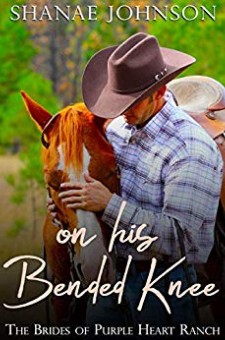 Maggie sees past Dylan’s injuries, but if she fails to capture his heart they both could lose it all: her beloved animals, his ranch, and each other. Find out if love can truly heal all wounds in this light-hearted, sweet romance of convenient arrangements that unfold into lasting love. On His Bended Knee is the first in a series of marriage of convenience tales featuring Wounded Warriors who are healed with the power of love.